FX has renewed the acclaimed new comedy series Atlanta and Better Things, it was announced today by Nick Grad and Eric Schrier, Presidents of Original Programming, FX Networks and FX Productions. Grad and Schrier stated, “It’s really gratifying to launch two new comedies that have received overwhelming critical acclaim right out of the gate and that are emblematic of FX's award-winning brand." "It is clear to us that Atlanta and Better Things have struck a nerve with viewers, which is a credit to Donald Glover’s vision for Atlanta and Pamela Adlon’s vision for Better Things. They, along with their spectacular casts, writers and directors, have created exceptional shows that we are incredibly proud to produce." On Atlanta, two cousins work through the Atlanta music scene in order to better their lives and the lives of their families. “Earn Marks” (Donald Glover) is a young manager trying to get his cousin’s career off the ground. “Alfred Miles” (Brian Tyree Henry) is a new hot rapper trying to understand the line between real life and street life. “Darius” (Lakeith Stanfield) is Alfred’s right-hand man and visionary. “Van” (Zazie Beetz) is Earn’s best friend and the mother of Earn’s daughter. Glover serves as Executive Producer, along with Paul Simms and Dianne McGunigle of MGMT Entertainment. Atlanta is produced by FX Productions. 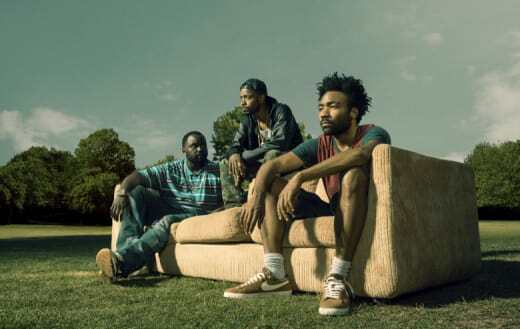 Atlanta scored the most-watched basic cable primetime scripted comedy premiere in over three years in the key 18-49 demographic. It has since pulled off the rare feat of building on its premiere audience in virtually all key demos and ranking as the most-watched telecast of a new comedy series in Adults 18-49 since April 2014. Better Things centers on Sam Fox (Pamela Adlon), a single, working actor with no filter raising her three daughters, Max (Mikey Madison), Frankie (Hannah Alligood) and Duke (Olivia Edward) in Los Angeles. She’s mom, dad, referee and the cops. Sam also watches out for her mother, Phil (Celia Imrie), an English expatriate, who lives across the street. Sam is flawed and fierce with her love for her daughters, and her own mother, as well. Sometimes, heaping the love on when she feels guilty. Sam’s just trying to earn a living, navigate her daughters’ lives, have fun with a friend or two and also — just maybe — squeeze in some private time once in a while. Adlon serves as Executive Producer alongside Louis C.K., M. Blair Breard, Dave Becky and 3 Arts Entertainment. Better Things is produced by C.K.’s production company Pig Newton for FX Productions. Better Things is FX’s most female-driven comedy ever. On a Live+7 basis, the premiere of Better Things ranks as the second most-watched basic cable comedy series premiere of the year among Women 18-34 (behind only FX’s Atlanta), which represented 73% of its Adults 18-34 delivery, and #4 in Women 18-49, which represented 63% of its Adults 18-49 delivery. By comparison, FX’s primetime average for Adults 18-49 this year is 47% female and 53% male. FX is on a creative streak that's simply unmatched. One show after another is not only worth watching, but worthy of all the awards. Perhaps we'll see these shows as Emmy contenders in 2017!